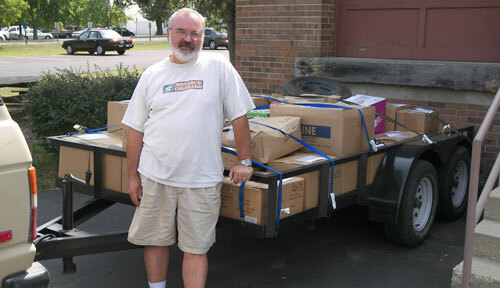 September 18–that’s when Randy and Toni Fennig hope to leave for Sierra Leone. Their support is in place, and they’re ready to go. Randy will teach at the Evangelical College of Theology just outside of Freetown and do agricultural development. Randy stopped by the office Thursday with a big trailer he had custom built to fit in a shipping container (standard trailers, he learned, are a little too wide). Global Ministries relayed a couple dozen boxes of materials for Sierra Leone–medical supplies, nursing textbooks, used clothing, and more. It’ll all go the shipping container. “Looks like we’ll get the container on September 3 or 4, pack it that weekend, and it’ll leave Portland, Ind., around September 8,” Randy said. Randy grew up on a farm in Portland. A seed company there is providing warehouse space and a loading dock. A lot of stuff will go into that container–a tractor, farm equipment, a solar electric system, the new trailer, and a diesel-powered 1982 Toyota Land Cruiser. With Hurricane Gustav rolling across Jamaica on its way to the Gulf of Mexico, Owen Gordon sent this note from Jamaica around 6 p.m. Friday, August 29. Thank God! We are ok! The torrential rain has been falling unabated all day! The wind is very strong at times, and the electricity fluctuates (some places have no electricity since yesterday). Even as I write, the rain is pouring down heavily. There is no reception from the television. However, we are alive and for the most part dry inside. Thank you for your prayerful concerns. The evening news reported seven persons dead and hundreds left homeless, roads have been damaged and many areas flooded, as Hurricane Gustav slowly mauls its way across the southern half of Jamaica. The entire country is being drenched with continuous rainfall. Our plans for Orientation for College students scheduled for today has been set back. We have had to close down operations since yesterday. We are hoping to go ahead with plans for orientation for pre-college students on Monday. Our numbers have shown indication of increase, however, we can’t count students until they are fully registered and turn up for classes. We are looking at a high of 150 with a low of 130. The full extent of local and national damage cannot be assessed until the rain stops, so there is going to be extensive damage. The cost will run in millions of dollars. We feel for the people of Cayman, Cuba, and the Gulf States as Hurricane Gustav strengthens and heads towards them. The Jusu family. L-r: Tity, Emmanuel (2), John, Juan (8), and John Jr. (10). 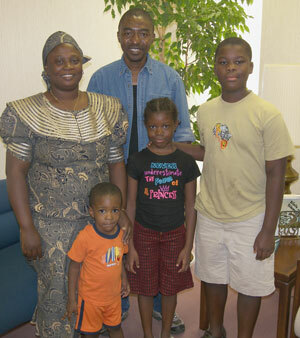 John Jusu and his family stopped by the office last Wednesday. John grew up in the United Brethren church in Sierra Leone. He graduated in 1982 from Bumpe High School (where one of his teachers was June Brown), and taught there for a few years. Then he attended Sierra Leone Bible College (now the Evangelical College of Theology), and also taught there. John is finishing his doctoral work at Trinity International University in Deerfield, Ill. He just submitted his thesis, and will defend it in two weeks. His degree is in church education and curriculum development. John plans to return to Sierra Leone in October to check on opportunities there (he has no specific assignment, and is not currently serving with the United Brethren church). If something doesn’t materialize in Sierra Leone, John says he’ll probably teach at the Graduate School of Theology in Nairobi, Kenya, which he attended 2002-2005 before the family came to the States. John’s wife, Tity, is the sister of Joe Abu’s wife, Matennah. They were on their way to Delaware to visit the Abu family. But John, having never visited Huntington, wanted to stop at the national office while he had the chance. Ruth Boggs, the mother of Laurel Mission director Titus Boggs, passed away Tuesday, August 26. Ruth’s late husband, Alvin, served on staff with Laurel Mission in the 1950s, and later started a school near the mission. The Festival turned out at least 200 unchurched people. Food, free school supplies, carnival games–all brought a lot of the community to the event. I believe we planted a lot of good seeds and hit the right button. Economically, people are hurting. We’re thinking now to keep the ball rolling by offering a free Thanksgiving dinner to families. L-r: Pat Jones, Ron Ramsey, Bridger Fetters, Jeff Bleijerveld. 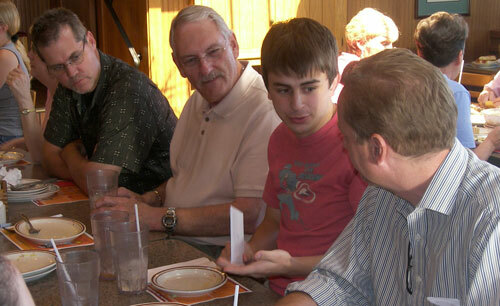 A pizza buffet seemed like a good way to say goodbye to Bridger Fetters, the summer intern for Global Ministries. So the entire Healthy Ministry Resources staff headed to Pizza Hut for lunch. Bridger returned to Huntington University this week; he’s a senior English major. Contacting missionaries and doing other groundwork for next summer’s Global Ministries Homecoming (with as many of our missionaries as possible coming to the States at the same time). Preparations for the Mission Team Leader Training events. Organizing hundreds of Global Ministries photos. Bridger also participated in the China English Camp in July and August (as he did in 2007). The first of five leadership training events took place August 22-23 at Salem United Brethren Church in Chambersburg, Pa. The sessions focused on developing effective short-term mission teams and covered the nuts and bolts of putting it all together like a pro. September 12-13: Emmanuel Community Church (Fort Wayne, Ind.). The cost for the two-day event is $60. The Huntington University men’s soccer team partnered with Mainstreet Church in Walbridge, Ohio, to host the Onside Soccer Camp August 11-14. Two coaches and 23 players worked with 86 children, ages 4-13. The children participated in drills, games and team time activities. This is the second camp the team has organized for the church and the community.